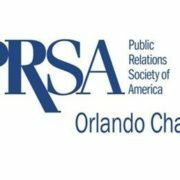 PRSA Orlando March Program: Taking a Stand For Ethics! What if your boss “banished you to the basement” for no good reason, what would you do? You’re two years out from retirement, you’re not sure you want to walk away from 32 years of federal service, but you don’t like moving down the ladder from Public Affairs Director to library clerk either. That was the dilemma facing VA Whistleblower Paula Pedene. In 2010 Pedene exposed mismanagement at the Phoenix VA because she thought she was doing what was right for veterans and staff. Little did she know such exposure would come back to haunt her two years later, forcing her and her family to face years of trial and tribulation. Her “banishment” led to an even more unusual discovery, exposure of the national VA wait time scandal. From the basement to the front page of the Washington Post, Pedene stood strong for veterans. Looking back, she says her faith and our PRSA values of respect, courage, honest and integrity helped her take a stand for ethics. Hear why PRSA named her 2015 PRSA Pro of the Year. https://prsaorlando.org/wp-content/uploads/2018/02/751_image_original.jpg 258 486 Andrea Dennis http://prsaorlando.org/wp-content/uploads/2018/09/PRSA-Orlando-logo.png Andrea Dennis2018-02-22 09:31:042018-02-22 09:32:50PRSA Orlando March Program: Taking a Stand For Ethics! Florida Technical University was established in 1963 with the mission supporting a growing U.S. space program. Now, more than half a century later, the University of Central Florida has grown to one of the largest public universities in the nation with enrollment exceeding 66,000 students from 157 countries. Under President John C. Hitt’s leadership, UCF has experienced unprecedented growth, momentum and prominence with 12 campuses including a downtown Orlando expansion, a college of medicine, a top athletics program, and a pathway to preeminence. 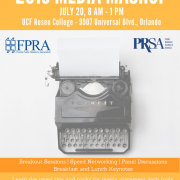 Grant Heston, UCF vice president of communications and marketing, will present a look at how strategic communications, branding, story-telling, partnerships and transparency are playing a key role in UCF’s historical trajectory and search for a new University president. Networking begins at 11:30 a.m.; the program begins promptly at 12 p.m. While Hurricane Maria bypassed the state, its impact on Puerto Rico has certainly been felt across Central Florida. As the central destination for evacuated residents, teams from across the region are working hard to welcome the displaced to the area, assist with affordable housing, and integrate their kids into the school systems. What does the impact on Central Florida look like from their perspectives? How has each entity engaged with one another? How has the communications structure evolved as the process progressed? What were their communications challenges and how were they overcome? Are we ready for the future impact if and when the residents return to their home on Puerto Rico? A panel discussion will be led by WFTV’s Nancy Alvarez, co-anchor of Eyewitness News Daybreak who has been an integral communications resource between those living on the island and their relatives living in Central Florida. Parking information will be shared closer to the event. No shows will be invoiced. Refunds will not be issued unless cancellation order is received at least 48 hours prior to event. We will keep you updated at PRSAOrlando, Twitter, Facebook,LinkedIn.